Rising water levels in Celesta Creek have impacted the loop trail to the falls and back in Albas campground on the Shuswap Marine. The public using the trail at this time will likely encounter water on the trail surface, and are urged to stay well back from the swollen creek banks and rock pools above the falls. Do not put yourself or others at risk! Access will continue to be monitored and future restrictions may need to be implemented. Caution! Celesta Creek trail at ALBAS campsite contains steep, rough sections with sharp drop-offs. Children should be closely supervised and pets kept on a leash. Serious injury and deaths have occurred in this area due to adjacent waterfalls, changing water levels, fast currents and cold water. Shuswap Marine is comprised of 23 sites located around the perimeter of Shuswap Lake. All locations are popular for fishing and water sports; hiking and nature study are popular at some sites. Some sites are road accessible, but most are water-access only. Facilities at the sites vary from nothing to 3 or 4 wilderness tenting sites with a pit toilet. Anglers take note: Shuswap Lake contains 19 species of fish! 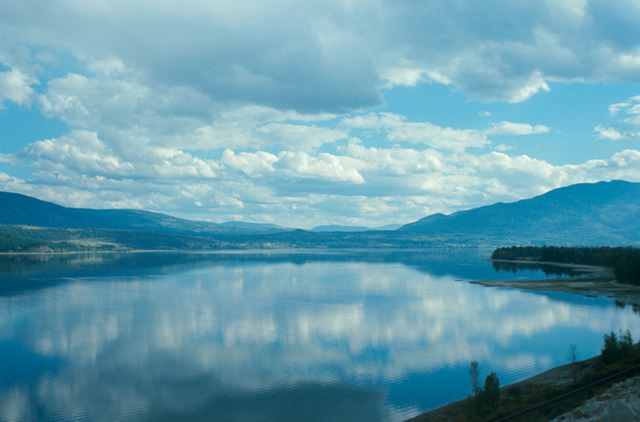 Shuswap Lake is shaped like an addled H, and is made up of four large arms: the Shuswap Lake Main Arm, Seymour Arm, Anstey Arm, and Salmon Arm. The product of the glacial scouring that also rounded the surrounding Shuswap Highlands, all four arms converge at Cinnemousun Narrows, northeast of Sicamous. While boating in the Shuswap, watch for buoys that may indicate divers in area, safe anchorage, or a swimming area where boats are not permitted. All boaters – please read the Greywater Discharges Banned from Vessels in BC’s Inland Waters [PDF]. Some sites do not have protected beaches. In stormy weather, it is advisable to beach your boat stern-first, and secure it with long ropes from the bow to pegs on the shore. Houseboats should be beached according to instructions received from the rental companies. The lake can drop 5 to 10 cm daily during the summer. Check your beached boat regularly, to avoid becoming stranded when camping for extended periods at parks with shallow beaches. Docks are provided in some areas for small craft only; do not tie houseboats to these structures period May 15 to Labour Day. Camping permits must be purchased in advance, except for campers staying at Cinnemousun Narrows or Silver Beach. For a list of camping permit vendors, click here. Consumption of alcohol is prohibited in provincial parks, except within your campsite. There are no public telephones at these small parks. There is cellular service in the area. Forest fire suppression is difficult in these remote areas. Use extra caution during windy periods. Please refrain from putting glass in fireplaces. Picnic tables can be protected by placing plywood or similar material under campstoves or hibachis. For sites accessible by water only, launch facilities are located throughout the Shuswap including at Shuswap Lake, Herald, and Mara Provincial Parks. As well, privately-owned marinas and the towns of Sicamous, Chase, Salmon Arm and Canoe all have boat launches. The closest communities to the park are: Seymour Arm, Anglemont, Celista, Scotch Creek, Blind Bay, Eagle Bay, Sicamous, Mara Lake, Tappen, Sorrento and Salmon Arm. History: The area is named after the Shuswap Secwepemc First Nations people, the most northern of the Salishan speaking people. This group was the first to inhabit the region, as evidenced by kekulis (semi-underground pit houses), which have been found at Scotch Creek and nearby Herald Provincial Park. Kekulies may be found in many of the locations of Shuswap Lake Marine Park. Pictographs or rock paintings have also been discovered around Shuswap Lake. During the nineteenth and early twentieth century, European explorers, fur traders and surveyors came to the area. Then in the late 1800’s, gold was discovered, and the population in the area soared. Today, little remains of these historic tales. Conservation: Flowers, trees and shrubs are part of the park’s natural heritage, please don’t damage or remove them Cutting of trees – live or dead – for firewood is strictly prohibited. Wildlife: Cougars and bears are occasionally seen here. Wildlife is potentially dangerous and may be encountered at any time. Make lots of noise when hiking where signs of bears are found. Practice safe food storage, and dispose of garbage in the containers provided. Park users should always be aware of bears and other wildlife in our park environment. Never feed or approach bears or other wildlife. Approved Purpose Statement and Zoning Plan [PDF] for Shuswap Lake Marine Park is available online in pdf format. All water sports are popular at Shuswap Lake. Shuswap Lake offers excellent recreational fishing opportunities for species such as Lake Trout and Rainbow, Bull trout, Kokanee, Burbot and Whitefish. Lake trout and Rainbows to 10 kg. Bull trout, Kokanee, Burbot, Whitefish. Mainly trolling for deep lurkers is the most popular technique. Anyone fishing or angling in British Columbia must have an appropriate licence. Scuba diving and snorkelling occur in Shuswap Lake; please check with local dive operators for more information. Waterskiing does occur on Shuswap Lake, please check with the Canadian Coast Guard for the current regulations and restrictions. Windsurfing does occur on Shuswap Lake please check with the Canadian Coast Guard for the current regulations and restrictions. Launch facilities are located throughout the Shuswap including at Shuswap Lake, Herald, and Mara Provincial Parks. As well, privately-owned marinas and the towns of Sicamous, Chase, Salmon Arm and Canoe all have boat launches. Transport Canada restricts all power-driven vessels to 10 km/hour while operating within 30 m of shore on all inland waters of British Columbia. There is an exception which permits vessels to travel perpendicularly away from the shoreline where a higher speed may be required to tow a skier, wakeboard, etc. While campfires are allowed and campfire rings are provided at each campsite, we encourage visitors to conserve wood and protect the environment by minimizing the use of fire and using campstoves instead. Firewood can be purchased at Cinnemousun Narrows Park or you may bring your own wood. Fees for firewood are set locally and may vary from park to park. Limited burning hours or campfire bans may be implemented. To preserve vegetation and ground cover, please don’t gather firewood from the area around your campsite or elsewhere in the park (this is a ticketable offence under the Park Act). Dead wood is an important habitat element for many plants and animals and it adds organic matter to the soil. This park has day-use/picnic areas. Beaches vary from sandy to rocky depending upon location. For location specific information please go to the “23 Locations” web page. This park has pit toilets, but no flush toilets. For location specific information please go to the “23 Locations” web page. This park offers vehicle accessible campsites on a first-come, first-served basis - campsite reservations are not accepted. Not all sites have camping facilities; where campsites exist, expect rustic wilderness tenting facilities only. For location specific information please go to the “23 Locations” web page. There are walk-in campsites available but no facilities are provided. The park is open year-round when accessible. For location specific information please go to the “23 Locations” web page.